Disney Magic Castle: My Happy Life allows gamers to play as their Mii, and you can meet over 80 different Disney characters throughout the game. The title will retail on its own at 5,490 yen (approx. £40 / €45 / $60) for both a boxed and download copy, with the 3DS LL bundle going for 24,830 yen (approx. £175 / €202 / $262). You can watch the first official trailer below. Would you like to see this one come to the West? my daughter would love this game. 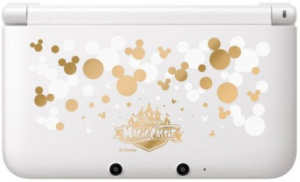 I want the 3DS XL though so if this came West I'd buy it in a heartbeat. I don't know why, but for some strange reason when I just viewed the trailer for this game, it kind of reminded me of the old NES game, Disney Adventures In The Magic Kingdom. I will say one thing for this game, it makes you feel as if you're taking a trip to Disney World right from your house without having to travel there. I like that concept. Kingdom Hearts and Animal Crossing's son? AC type of game? Doesn't look to bad. Has Namco Bandai ever done a Disney game before? This looks really interesting. Reminds me a lot of Kingdom Hearts, Animal Crossing, and Disney's old MMO game Virtual Magic Kingdom. I would hope this would come west, since Disney is very popular here. I 'd love to see this come west. This is interesting! Although something seems a bit lacking. But I would definatey buy it if it ever arrives over seas. Also, the models of the characters look really nice! @Emaan But animation is a way bigger deal over there. Yet another special edition Japanese 3DSLL/XL! How many are there? 10? How many in the US? 0. Anyone notice a slight disparity here? This game looks pretty cute! I think it would be nice for it to be In NA, since Disney is really popular. I would totally buy it. The 3DS XL (LL) looks really nice. We need one like that in NA >_<. OMG I want it Love the 3DS XL and the trailer. Look at all those cute outfits! Not really my thing, but I could see how a little girl would love it. I actually hope that this comes to the west. Looks pretty cozy, and the fighting scene looks interesting. And the mayor + is all the disney charachters and locations. This honestly looks like the Level 5 game Fantasy Life, but with disney characters. Animal Crossing with Disney characters? Hopefully they actually take the time to make this a good game instead of some sub-par kiddy game. If this came out in the US, I would buy it instantly without thinking about it. That 3DS XL is beautiful! The only reason I haven't upgraded to the XL is because the quality of their appearance is so poor here. Also, I would love that game! NOA you bring it here, NOW! This idea does remind me of VMK slightly as well. It's something I would download. I NEED THIS RIGHT NOW!!!! Omg, love it! I do not believe that ALL of the Disney Properties will be represented. If this game is like AC and has online co-op I am buying! Please No local Wifi in North America. ONLINE! ONLINE! ONLINE!